Better Projects: What to do about the resisters to change? What to do about the resisters to change? Here's an idea that was suggested to me today; People who resist change will still change. They just change slower than others. The idea is that resisters are really trying to hold the status quo. If your early adopters and the middle packs move on to the new way of thinking and doing business the status quo eventually changes. After a while your change resisters have adopted the new status quo. Of course by this time, you are invested into the next (or the subsequent) change initiative. The picture above respresents this idea and is from an article on feedback loops, which is retelling a story from the 70's. Check it out. 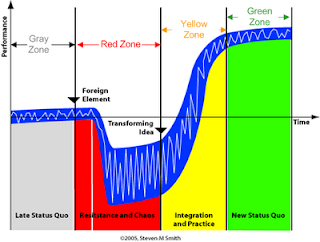 As a project manager, I see the resistance to change as one of the most problematic things in today environment. Projects tend to be more volatile due to unforeseen reason and customers constantly changing requirements. I appreciate your points of view. Thanks also Primoz - the google translation was abysmal, but still readable. I see the pattern in these articles. Your were focused on project management processes and loosening the bureacratic noose around project's necks. My intent was a bit broader. I was thinking about the people that take on the results of change projects, and waht to do if frontline are simply not wanting to play senior mangaement's change game. Either way the same principles apply. On the topic of breaking away from bureacracy, I see the failure of many project managers being a mix of factors around their individual professional skills and the maturity of the organsiation they work with. Both the project managers and organsaitions are becoming more mature at a growing rate. We'll also probably start to see the results of agile process zombies in the next few years, followed, like all good practices by a maturing and bureacratisation. But maybe we won't. let's watch and see. Just a small trivial comment. It's resister not resistor. A resistor is an electrical part that reduces the current flow or lowers a voltage. A resister is a person who resists an idea - good or bad. War resister for example. a couple of notes about resisters. PMs are often hired to implement change, but rarely do they have the contextual understanding or background to analyze if the change is actually beneficial. Change can be for the better or it can be for the worse. Were those who resisted communism bad? If some new executive with hair brained ideas hires a hotshot PM to implement a value-destroying initiative, are the resisters bad? If a company decides to implement a global business process reengineering project that has no hope to ever pay for itself, succeeding, are the resister bad? The last two are personal for me. As part of the implementation team in the second one, I learned lessons that led me to quit my company when the third one was attempted. For consultants, independent and as part of large companies (Accenture, Deloitte & Touche, BCG, McKinsey etc.) and large ERP/CRM/KM software companies (SAP, Oracle, etc.) it makes no difference if changes are beneficial or value destroying. All that matters to those companies/people is that they get paid. I would say it probably splits 50-50 whether the resister is right or wrong. Equally, if a PM/consultant/consulting company is hired, it is not really their place to evaluate the correctness of the resister. They are paid to implement what they are paid to implement. If it is alright, I would rephrase the question. "When is it worth the effort for an hourly/short-term change agent to take on a salaried/long-term resister?" The follow up would logically be: "How to finesse the situation when you're not likely to win the battle." If you're interested in doing it as a joint series of posts, let me know. It's an interesting and personal topic for me, even though my business has pulled me in a different direction from PM. Glen - nice pick up. I usually don't make spelling mistakes, although about every second sentence has a typo! I'd add a couple of refinements to your post. "Resisters" are people who are not doing what some other person (usually one who has some power) wants them to do with the eagerness and alacrity desired. People hold onto the Old Status Quo because it contains something they value. That's often something that the person pushing a change doesn't value, or doesn't see. Sometimes the valued thing is memory of what used to be. People will change to save something they value. So framing the change in those terms will draw people rather than pushing them. Thanks for the comment, and for the human centred approach to the issue.